Brawoliner 3D is a premium transition liner designed for ambient and hot water cure. It is a woven, seamless liner suitable for installations with multiple 45 degree and sweeping 90 degree bends, and/or transitions. It can upsize from 3 to 4 inches, from 4 to 6 inches and from 6 up to 9 inches. Super Flex liner is an economic solution for 45 degree and sweeping 90 degree bends, and is suitable for use in both ambient and hot water curing applications. Scrim liner is designed especially for accuracy in straight shots where there are no transitions. This scrim-reinforced liner prevents longitudinal stretch and ensures an accurate inversion length. HydraLiner’s new ambient epoxy system is specially designed to deliver quick set times—about 1.5 to 2 hours— and working times of 25-30 minutes without the need for heat. It is available in 5 gallon, 55-gallon, and 275-gallon containers. Epoxy to hardener mix ratios and cure times can be easily calculated using the HydraLiner Calculator mobile app. The free app may be downloaded from the Apple App Store, Google Play or the Windows Store. 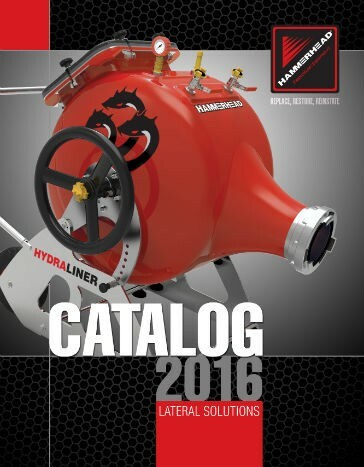 HammerHead Equipment has also released their 2016 Lateral Solutions Catalog, which lists all the above products and many more in 48-page print or digital versions. Print versions can be obtained by calling 800-331-6653, and PDF copies are available on both the HammerHead Equipment and HydraLiner websites. Those financing options include the new HammerHead MasterCard from Bank of the West, a dedicated commercial line of credit that Boldan says offers customers an easy and convenient way to pay for equipment and consumables.